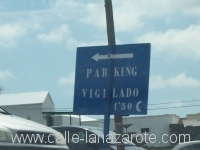 The car park at Arrecife airport is split into two halves. One half is reserved for the hire car companies, who park their fleet there when not in use. The other half is open to the public and has one of the most unusual price structures that I have ever seen for a car park. They charge by the minute. Admittedly the price is only between 1 and 2 cents per minute, and as of 2009 the first half hour is free. 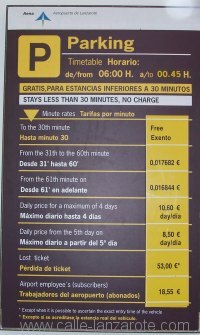 So effectively that is about 1 Euro per hour, making it cheaper than most car parks in Germany. But still, as fair as it might seem to have such an exact method of charging, imagine what it must be like to have to wait in a long queue at the ticket machine on your way out and see the minutes ticking by! What it wants to do is to ask you politely not to park in front of the entrance, but it should read “Bitte vor diesem Eingang nicht parkieren”. Actually, in this case, the translation is technically correct – in Swiss German the verb would be “parkieren”. The sign was seen on the entrace to a complex on Lanzarote – perhaps they have a lot of Swiss park in front of the gate?